Today we're going to take a closer look at common wall construction in these Swedish factory houses we've been studying. 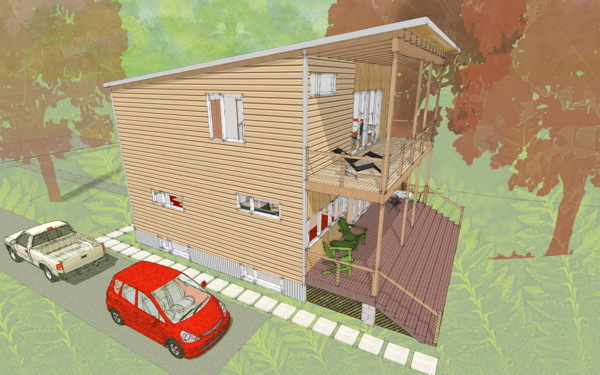 The Swedes build their energy efficient homes using fairly ordinary materials that are not very different than what we use in the US. Ultimately we would like to propose a analogous wall system composed of materials widely available in the US - an American version of the Swedish wall. But first we have to look closer at what they are building. Several of our earlier posts in the Letters from Sweden series touched on this. 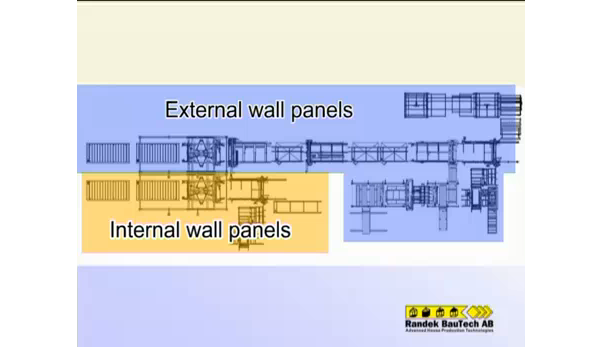 Most recently we looked at an automated assembly line, and through observing the assembly process we could see the various layers of the wall. Now we'll look closely at each layer using examples from a few factory web sites. 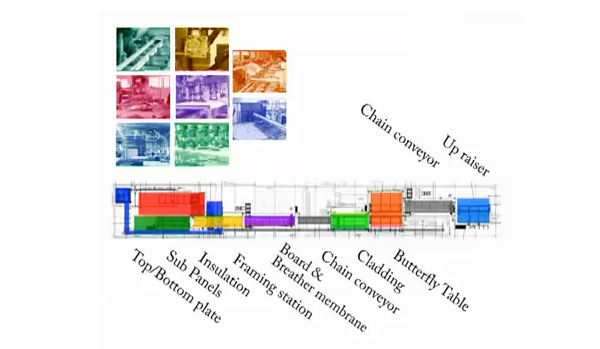 Some Swedish factories market themselves as being green and some offer passive house options straight from the factory. What we will look at here is what I've found in my research to be very typical of Swedish house construction. A baseline if you wish of what the average wall in a Swedish house looks like. Continue reading "Letters from Sweden - A closer look at the Swedish wall"
Continue reading "MoTrad House - finishing up under foot"
Texas Plat House - Owners still working that house! A nice surprise today in my email was a group of photos from the Owners of the Texas Plat House near Austin. They've been busy putting the finishing touches on their house and wanted to share! Outside the deck has been sealed, and has taken on a deeper wood color. 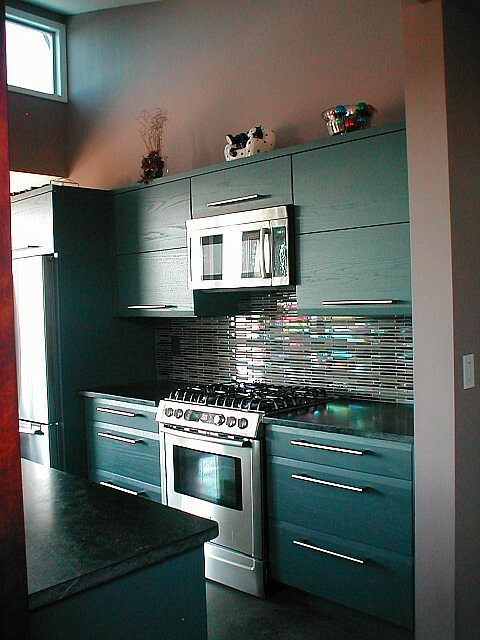 Inside they have tiled their backsplash with some great looking horizontal bar like tiles. More photos of the finished kitchen and the rest of the work can be seen in the Texas Plat House flickr set. 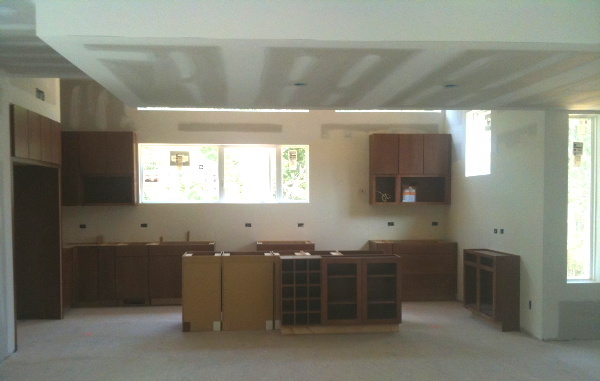 Remember - they are in the woodworking business, and built this kitchen themselves. Hook up with them for your project! 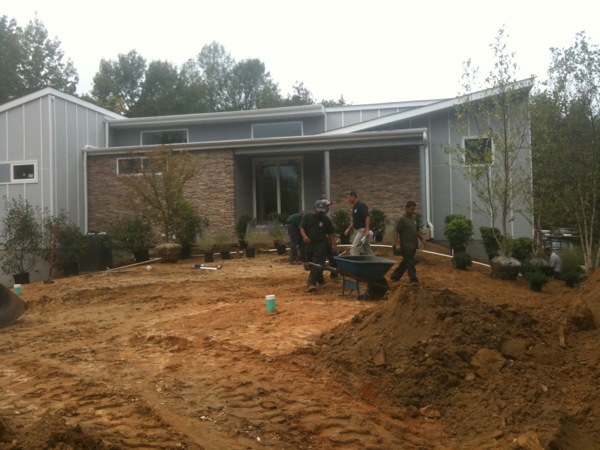 Continue reading "Texas Plat House - Owners still working that house!" 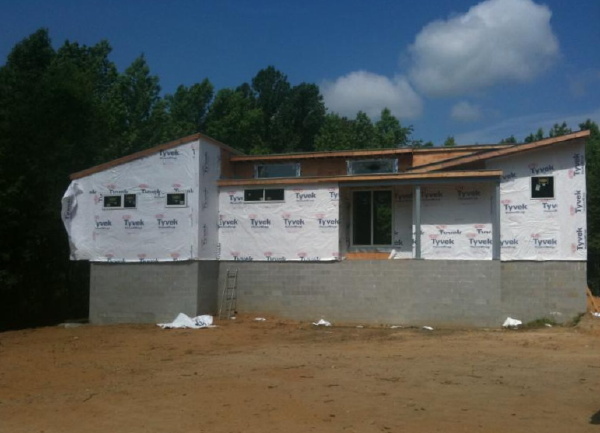 Just thought you would want to know - foundations and basement walls racing along. 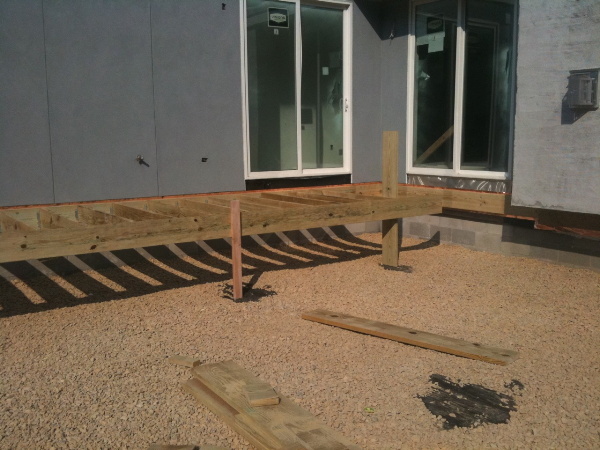 Next the new beams and posts in the basement, new first floor deck at the addition. Then the fun really begins! 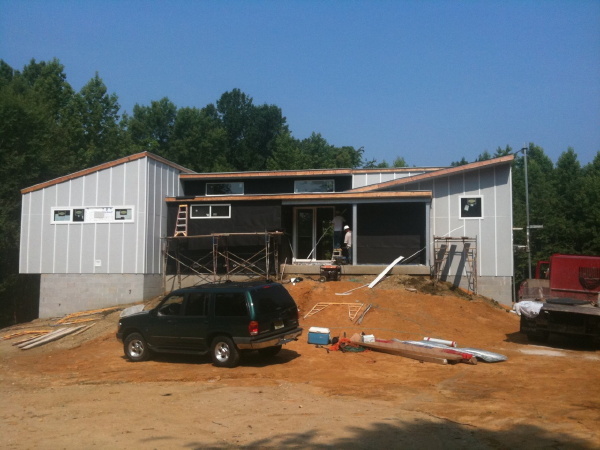 Continue reading "MoTrad House - making quick with the foundations"
Continue reading "Letters from Sweden - Automated panel building in the USA"
Things are moving right along with the MoTrad House project, that is if moving right along means leveling the existing house down to the ground floor, then yes, its moving right along in spades. I know the idea here is to rebuild the house anew. And I know that this is what the owner wants, and I've actually helped him do that. Yup, but all the same there is something a undeniably disconcerting about seeing an existing house come down. Its like the 5 second rule when you drop a cookie on the floor. If you pick it right up - hey, that's still a good cookie. Right. Too late here. That cookie is gone. Lots more pictures on the Flickr set. 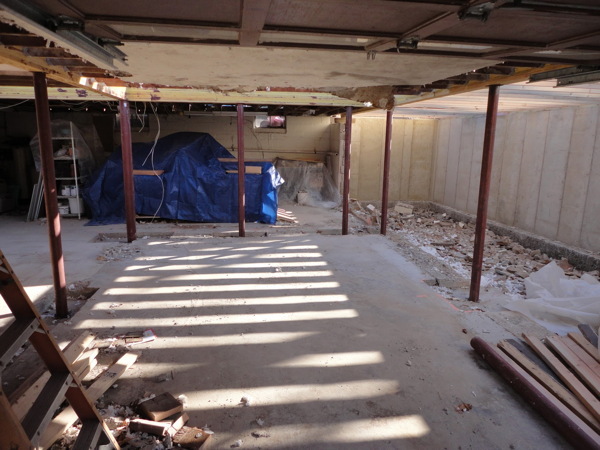 Demolition of the basement garage walls has happened, and prep for new foundations at the new bearing points is underway. You can see photos of that work as well as more of the demolition. 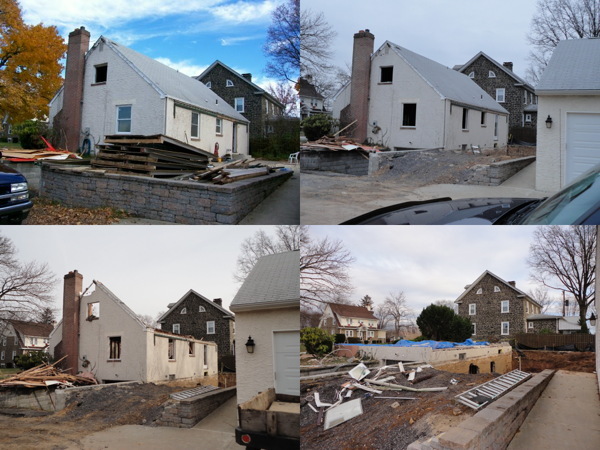 Continue reading "MoTrad House - going, going, gone"
Continue reading "0751 RS House - settled in for the holidays"
Its always a good day when we get to announce the availability of a new set of Construction Prints. 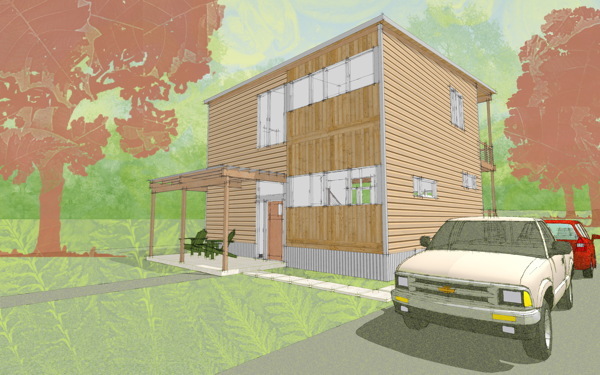 This means there is a new design that somebody could build, more possibilities, more opportunities, more options for folks who want a modern house. 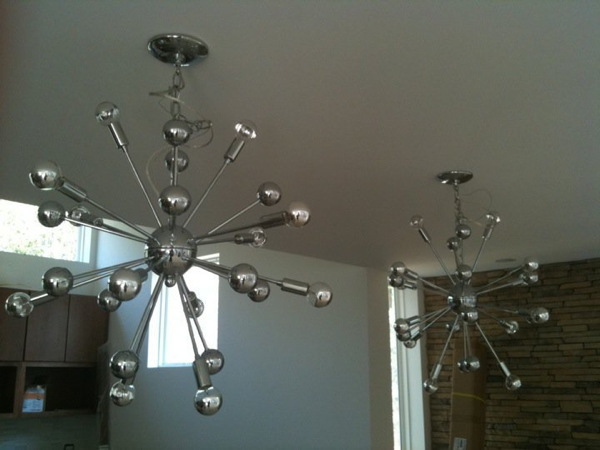 The XHouse3 is part of our XHouse Collection, our group of designs intended to be responsive to current design trends. 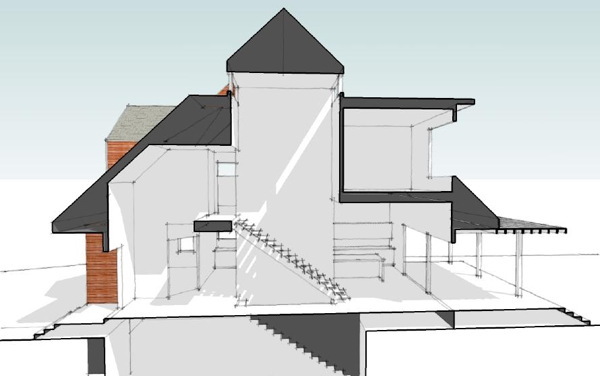 Furthermore the XHouse3 is our first houseplan in what I'm calling a MoTrad design theme - a fusion of traditional massing and form and a modern handling of space, detail, trim. The result is a house that lives comfortably with traditional houses side by side, but surrenders nothing in its commitment to living in today. It remains fully a modern house. There was a great mini review of this design on Ready Made Magazine's blog, written by one of their editors. We had begun the Construction Prints in earnest back in March 2010. 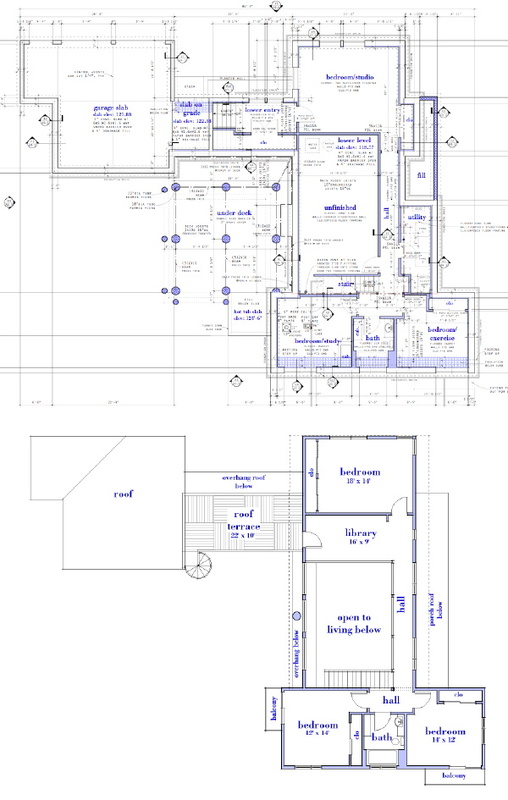 But it was delayed due to other activities, the complete redesign of the houseplan catalog, and following that the redesign of the web site for our local practice. We also worked on our new collaboration with Bensonwood during this time, so although the XHouse3 has been delayed, much has been accomplished in the meantime. 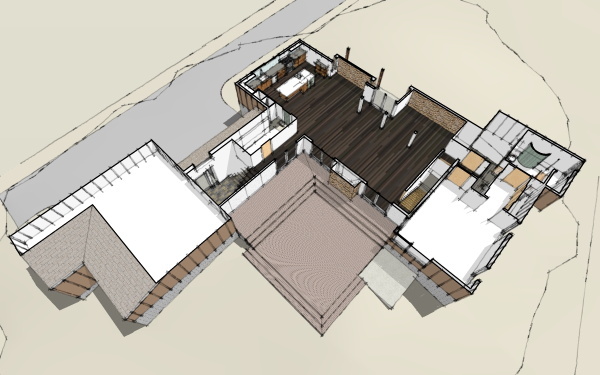 We hope for the XHouse3 to also find its way into the Bensonwood offerings so that there can be a highly energy efficient option for this house as well. 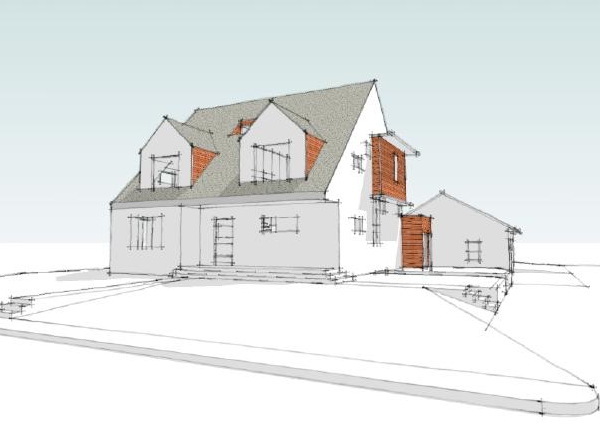 But for those waiting for this home, the wait is over, plans are available now. 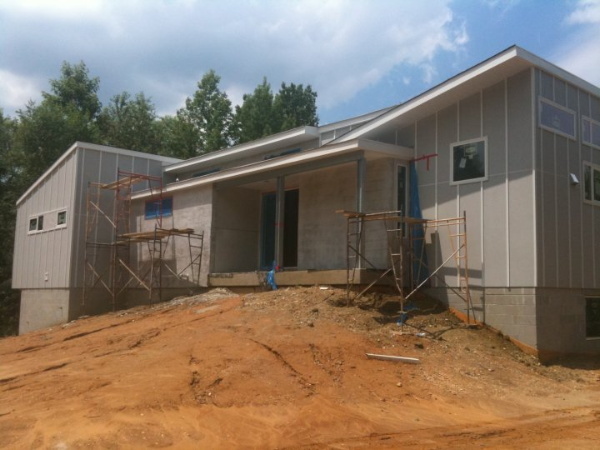 Continue reading "XHouse3 - Construction Prints Done!" 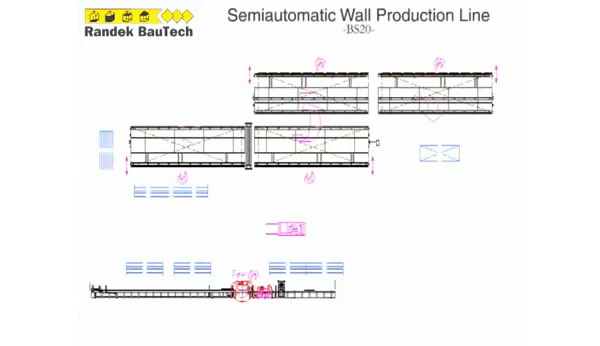 Last time we looked at a near fully automated closed wall panel assembly line. I said that you really don't need all that automation to build houses the Swedish way, so today we'll look at a much simplified process. 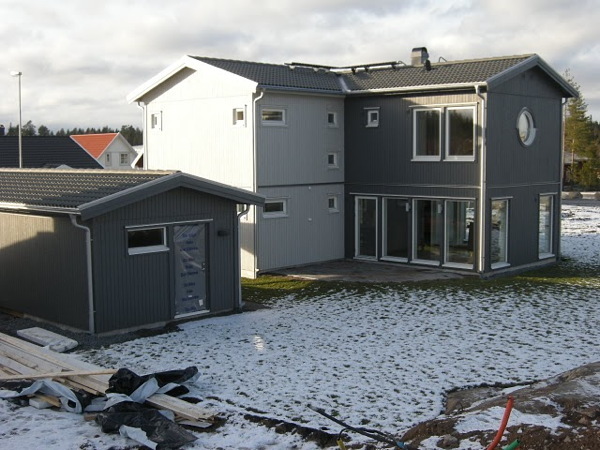 This is the way most houses in Sweden are built. What we are about to see is the Swedish Flip Table - a hydraulic tilting table that allows you to easily turn a wall panel over so you can work on both sides. That is the key really - keep the panel on a table so you can reach everything without ladders, and be able to flip it over so you can work on both sides. Each side of the Flip table is a workstation where you can complete both the inside and outside of the wall. We saw this table in the full automated line, but here we can see how just this table allows a factory to set up a simpler and effective work flow. In this example it is supplemented by an additional work table on either end of the flip which expands the total workstations to four. Smaller factories often use just the flip table, or two. 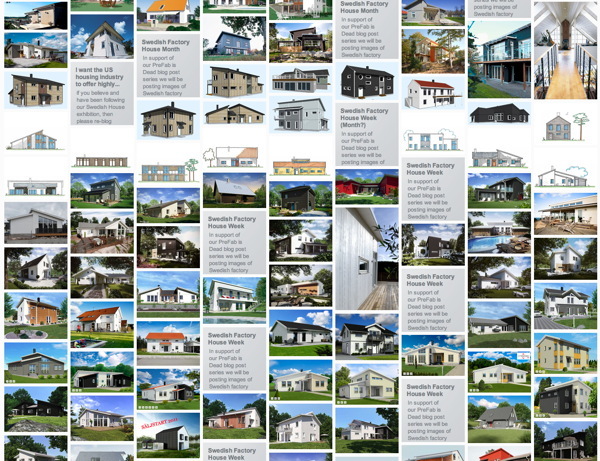 Continue reading "Letters from Sweden - A look at a simple assembly line"
Continue reading "Letters from Sweden - A closer look at a closed wall panel assembly line"
Today I've asked my correspondent from Sweden, Scott, to layout how the confluence of "Modern Green PreFab" and Architecture has profoundly missed its mark. 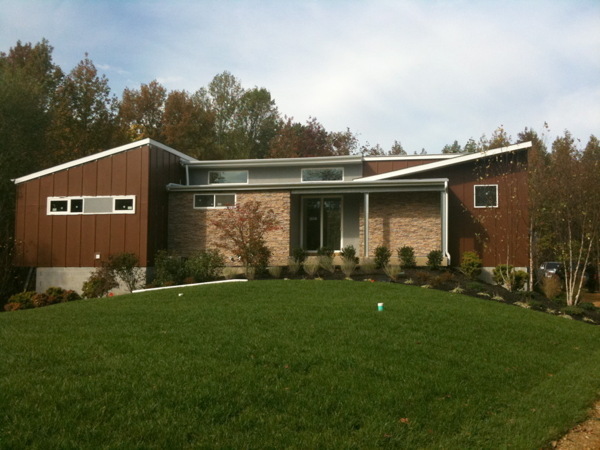 You are right Greg, “PreFab” as discussed in America by architects who are passionate about “modern” is dead. The chronic and seemingly unshakable idea in the architecture world is that there is a relationship between how a building looks, and how a building is built. We have to come to terms with this and move on. 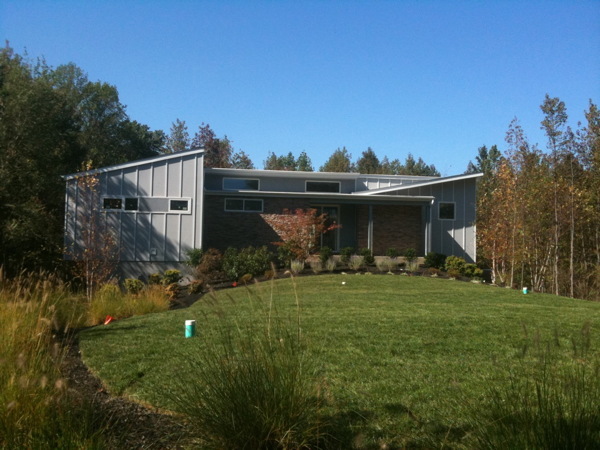 I think we need to lead a 12 step program for the “modern green prefab” enthusiast. First though, there has to be an admission that these enthusiasts can not control their compulsions. They must surrender to a higher power (the logic of manufacturing), they must examine the past, make amends, and learn a new code of practice. Continue reading "PreFab is Dead - How Architecture Failed PreFab"
Shocking headline intended to get your attention? Guilty. But its true. 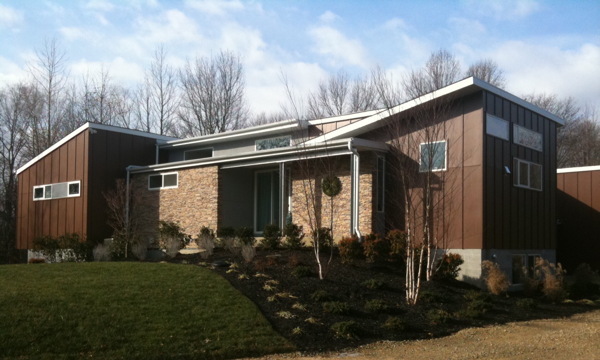 Modern PreFab burst on to the scene 10 years or so ago. 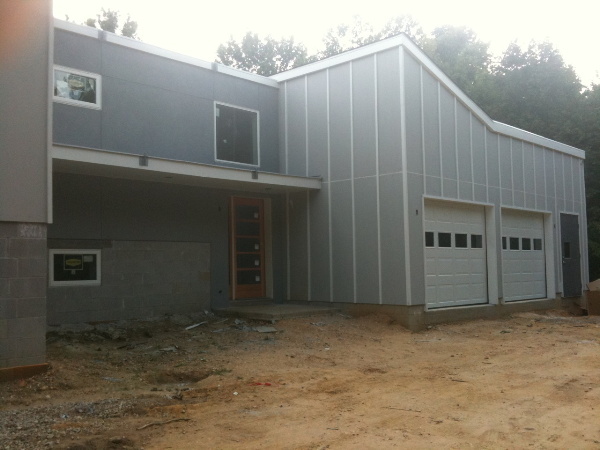 Before we knew it everybody was a-buzz about PreFab. Magazine articles, newspapers, cable tv shows. Lots of ideas were being tossed out, and some houses were being built. Everybody was hopeful - this is it! 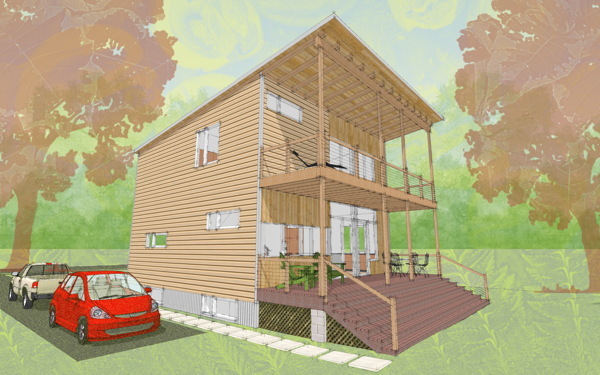 We might finally see modern homes priced competitive to standard production homes, all thanks to PreFab. And then just like every PreFab cycle that came before, it was over - again - with little to show for it. Yes, some nice houses were built, and yes, a few are still being built. And capping it off MOMA had a PreFab exhibit, one that should have embarrassed any architect. It was the crown jewel to announce that PreFab had arrived! But was actually more of a postscript on why it had died, again. So here we are on the other side of the cycle and what have we learned? The housing industry is largely unchanged. 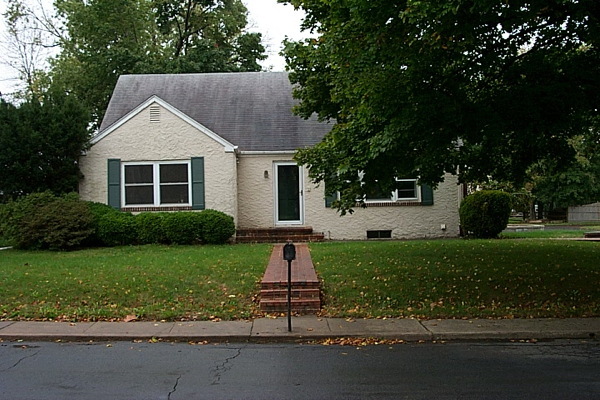 Design of status quo homes has not improved. Modern is still not readily available. This time around lets just see it for what it is. Call a spade a spade. 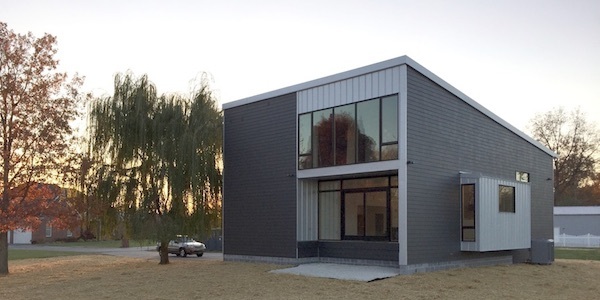 PreFab is dead. 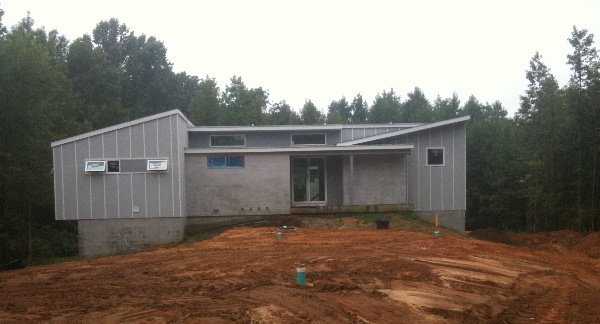 Continue reading "Letters from Sweden - PreFab is DEAD"
Continue reading "0751 RS House - painted!" 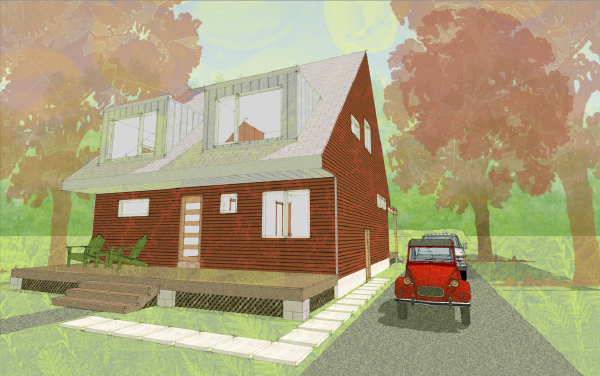 I have been working on renderings of this new XHouse2 version over the past few weeks, and I'm finally ready to show them. I'm not ready to reveal all the details of what this is about yet, but we can look at the images and at some of the differences. 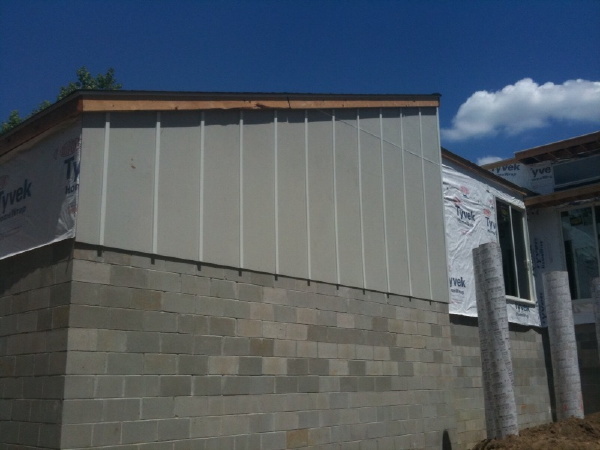 The Construction Prints for the XHouse2 include three different cladding schemes. 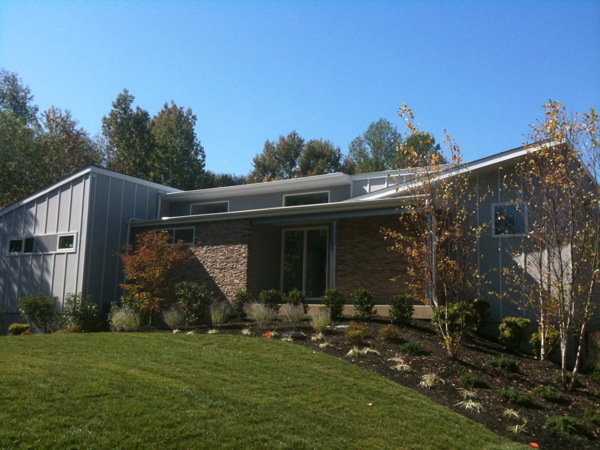 There is a simple fiber-cement scheme combining lap siding panels and board and batten panels. There is a plastic laminate panel option which features exposed flashing at the joints. 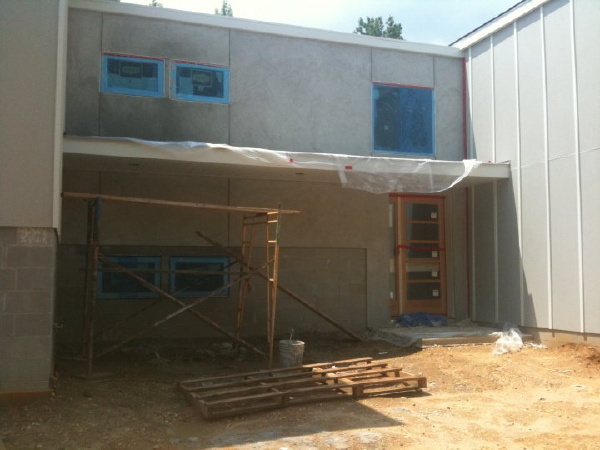 And there is the rain-screen cladding option which is the appearance which was featured in the renderings of the house. The first thing you will notice about this new version of the XHouse2 is that it is not sporting any of those cladding schemes. 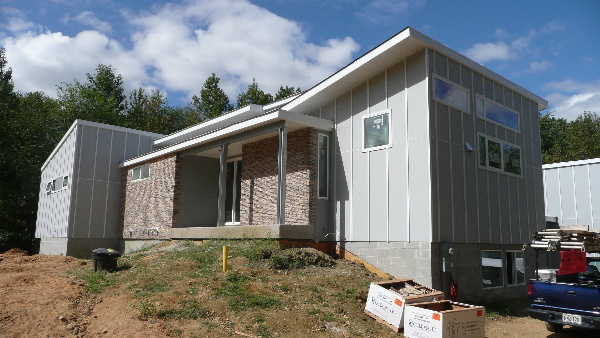 The cladding on this new XHouse2 scheme is a combination of ship-lapped horizontal panels, and flush vertical siding panels, all in solid wood. 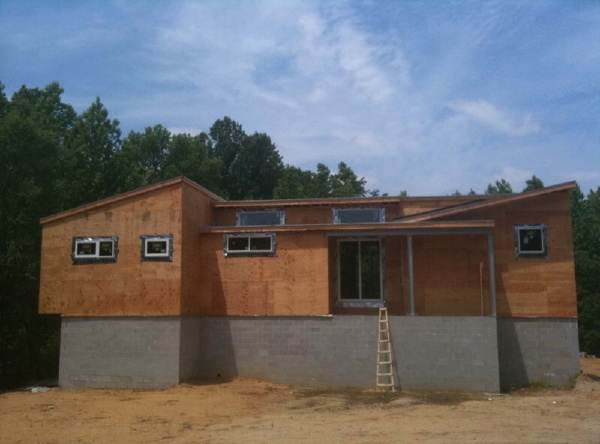 You will also notice that the steel framing from the original version is now replaced by timber post and beam framing. Similarly the cable railings are framed in wood rather than angle irons. Lastly you'll notice that the foundation wall at the basement is now clad in corrugated metal which will be protecting an external insulation layer at the basement level, all designed for greater energy performance. Which will be key to this new version. Stay tuned, we are working to reveal this as fast as we can. 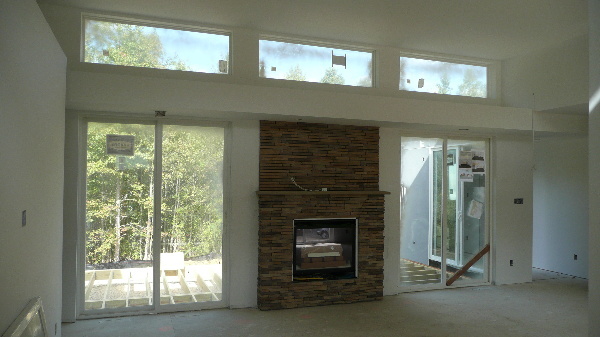 Continue reading "XHouse2 - New version breaks cover." The project has officially turned the corner, with the sodding of the lawns it no longer appears like a construction site. Many loose ends to tie up and details to finish or correct, but the movers have been scheduled and its nearly time for the house to start its life. What a difference to see the house with a blue sky! The siding still has not been painted, so there will be at least one more great transformation outside before the big transformation that comes inside when the owners occupy. 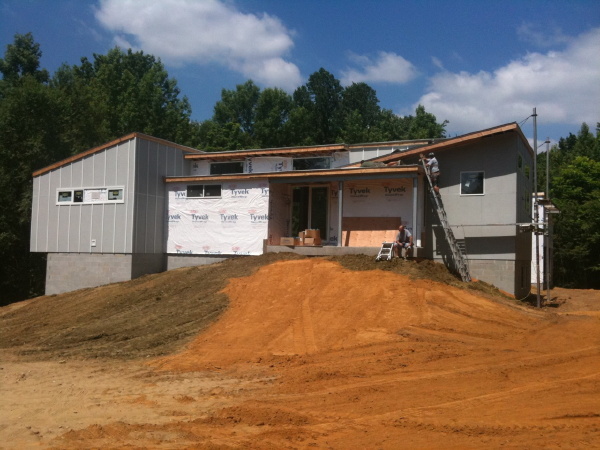 Remember the RS House is offered in a two story version as a house plan through our catalog. 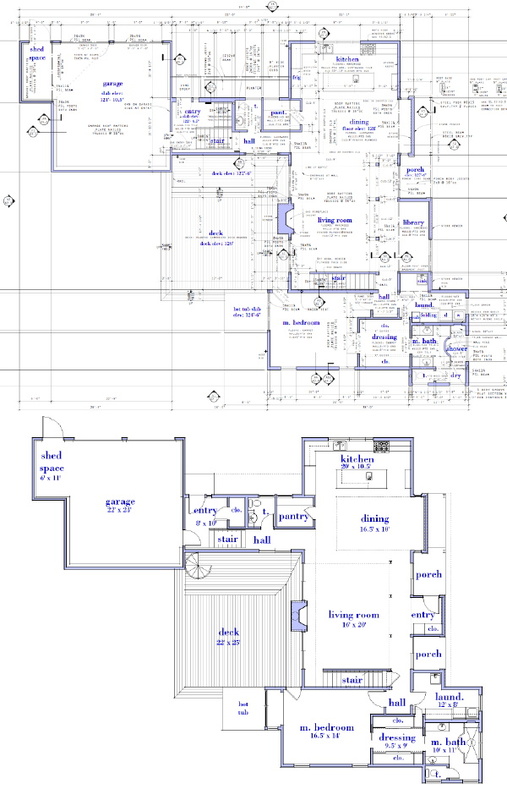 Note, plans for this house design are offered at a much lower price than the rest of our collection. 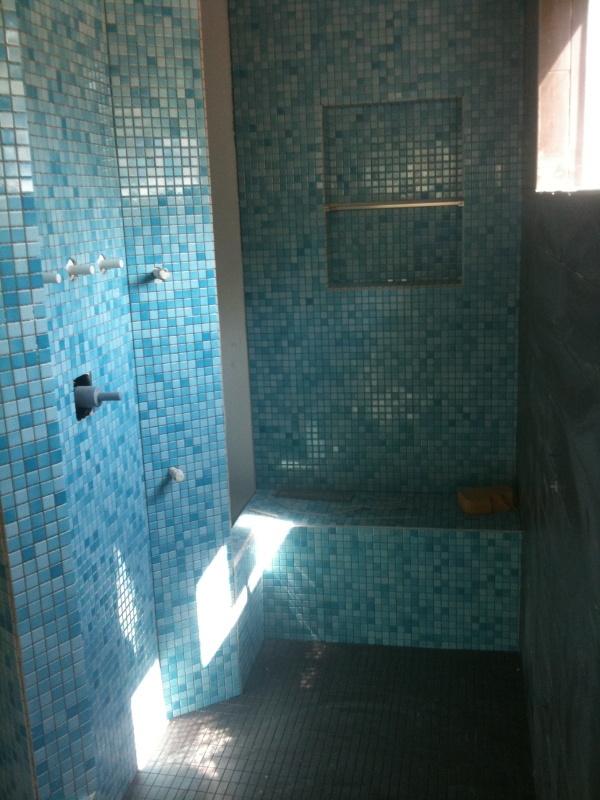 Continue reading "0751 RS House - no longer a construction site"
All the fittings and fixtures are in the Master Bathroom now, but for the glass panels flanking the shower. 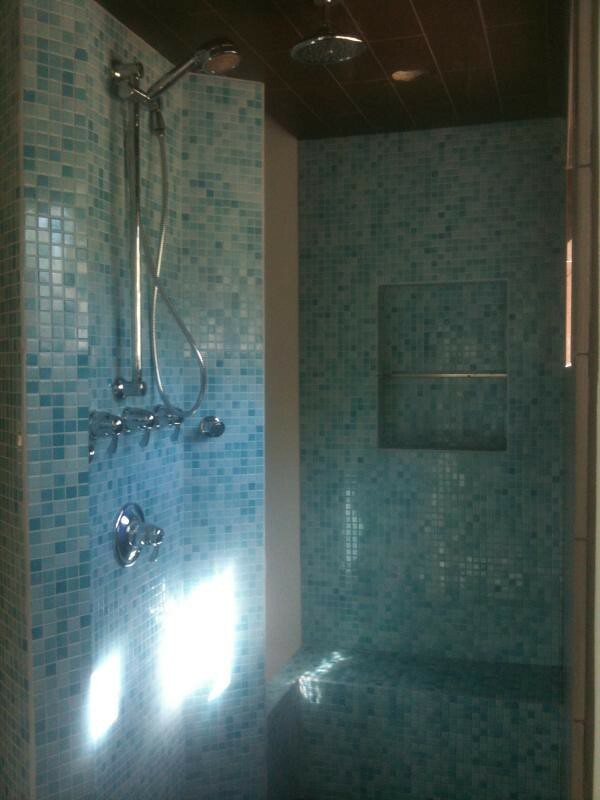 The shower has a ceiling mounted "rainfall" head, and hand spray in an adjustable mount, and a couple of wall mounted body sprays. Continue reading "0751 RS House - shower time"
The dark wood flooring we showed in the early renderings is down and looks great. Also this is shot at night, so the light in the photo is all coming from the house lighting. Given that I don't think the dark flooring make the room dark. In fact I think during the day it will look even brighter. 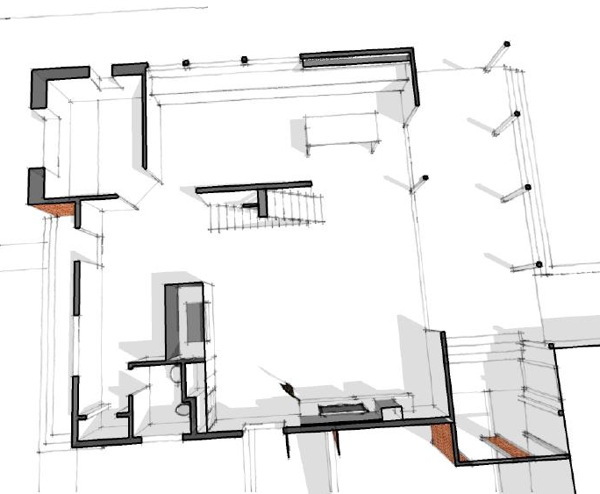 We actually had the flooring running the other way in the 3d model, but its incorrect. 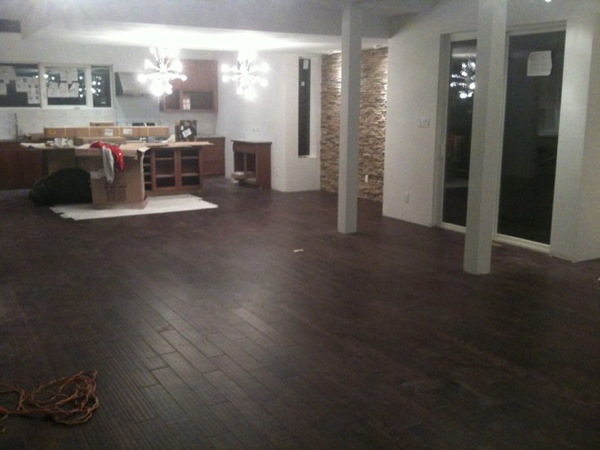 The flooring typically runs across the joists as it was installed. A few more new photos are posted over at the Flickr set. 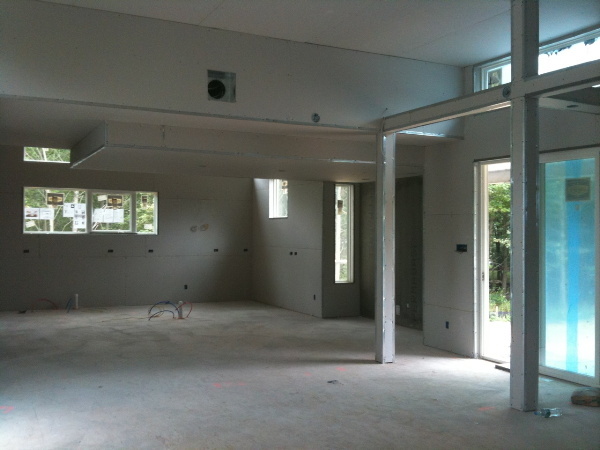 Continue reading "0751 RS House - more interior work"